After getting dumped by her married lover who was the husband of her late husband’s mistress (it’s a very long, very French story), Bettie starts smoking again which pisses off her elderly mother to no end. Then, on an impulse—or is it a whim?—she hits the road, abandoning both mom and their failing bistro. Because Bettie is played by arthouse royalty Catherine Deneuve, we never lose sympathy with her, even when she does foolish things. Like, for example, getting drunk at a bar in rural France and letting a young hottie (the rakishly charming Paul Hamy) pick her up for a night of amour fou. In a mildly contrived subplot, Bettie receives a frantic phone call from her estranged daughter Muriel (Camille) who demands that she pick up her 11-year-old son Charly (Nemo Schiffman) and drive him cross country to his paternal grandfather’s house. Out of guilt or perhaps just idle curiosity—Bettie and Muriel haven’t spoken in years, and she’s never even met her grandson—Bettie makes a U turn to retrieve Charly. The precocious tyke proves to be a real handful for his sixtysomething grand mere, even running away when they stop for gas. Despite some additional speed bumps along the way (including maxed out credit cards and a brief hospital stay), they eventually patch up their differences and become the best of friends. As if there was any doubt, right? 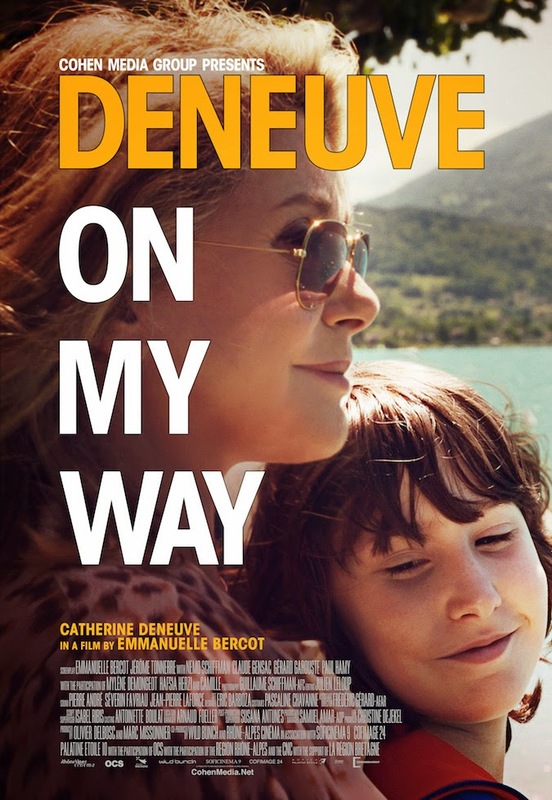 No one will ever confuse Emmanuelle Bercot’s ON MY WAY with the numerous auteurist masterpieces Deneuve has made throughout her 50-year-plus screen career with world class directors like Truffaut, Polanski, Bunuel, Desplechin, Demy or Techine. But for a gimmicky road movie, it’s charming boulevard fare. Bercot displays a remarkably deft hand with her actors as well. The 70-year-old Deneuve is a veritable force of nature, of course. She’s one of those screen goddesses whose very presence inevitably stirs memories of previous career highs (REPULSION, THE UMBRELLAS OF CHERBOURG, BELLE DE JOUR, take your pick), and it’s great seeing her in such exquisite form. Besides Hamy, Camille and Schiffman, there are also strong supporting turns from Claude Gensac as Bettie’s persnickety mom and Gerard Garouste as Charly’s grandpa who, not surprisingly, takes a romantic interest in Bettie.